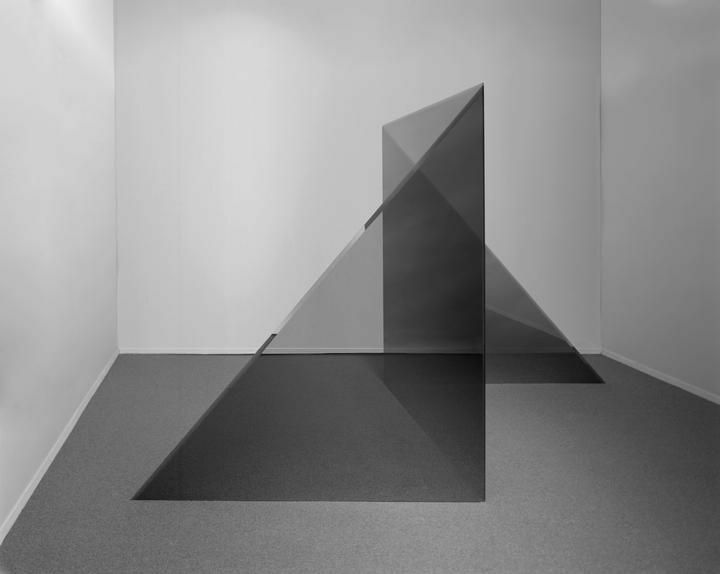 Larry Bell has entered the annals of art history as one of the members of the California “Light and Space” movement, a group of artists who, in the 1960s, made innovative use of materials like polyester resin, glass, and cast acrylic, even as their East Coast Minimalist counterparts (Richard Serra, Donald Judd, Carl Andre, et al.) pursued similarly reductive aims in weightier mediums. The West Coast artists were fascinated by perceptual phenomena, playing with light and optical effects, while those working in New York stressed the uncompromising physicality of the sculptural object—no razzle dazzle, just the thing itself. Mr. Bell moved to Taos in 1973, and has in recent years been enjoying renewed interest thanks to shows at top galleries in Los Angeles and London, and installations at the Chinati Foundation and the 2017 Whitney Biennial. So it’s fitting that his part-time home base (he still heads for Venice, Calif., every few weeks) of the past 45 years should pay tribute with a show of works—not quite a retrospective but a generous selection. ”Larry Bell: Hocus, Focus and 12,” at the Harwood Museum of Art, is ably curated by Mr. Bell’s longtime friend and collector Gus Foster. 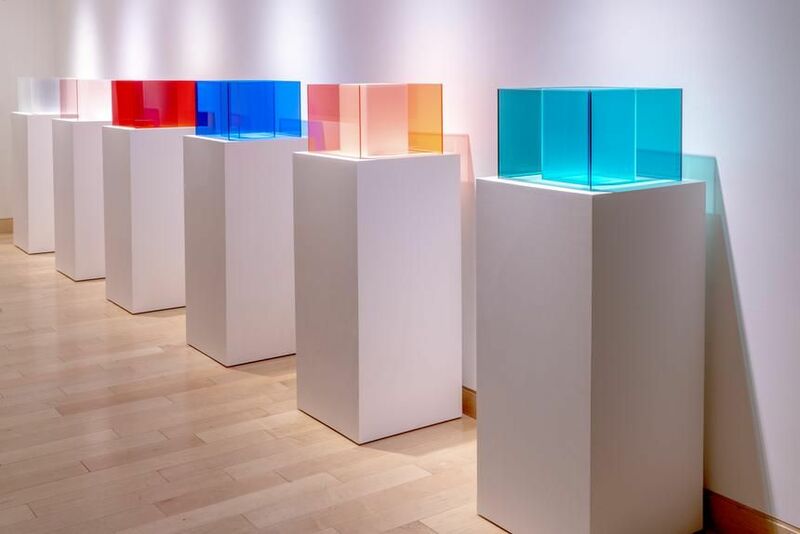 The earliest sculptures to gain serious attention from critics and curators were simple cubes resting on transparent pedestals, first constructed in the early 1960s. He has made these throughout his career, later exposing them to the process that has become his signature—from drawings to works on Mylar to large-scale installations. The show appropriately opens with “Cube #41” (2006); its smoky mirrored surfaces reflect without obscuring the literal identity of the cube, aligning Mr. Bell with the Minimalist urge toward “specific objects” while adding mystery and evanescence. Those same qualities are what lift the “vapor drawings” in the Harwood’s long introductory gallery out of the realm of both plain and plane geometry. One untitled work on paper is simply a series of black bands, but they graduate from matte to shiny, almost rippling along the way. “Melin 31” (1985) is a gleaming, skinny oval that slices the paper as nimbly as the pinstriping on a Corvette, while “Mirage #247” (1990) is a “crushed” vapor drawing whose surface suggests crumpled canvas and gift paper. At the far end of the gallery is a series of diminutive works called “50 Fractions” (1996-97) made from leftover bits and pieces, above which hover “Light Knots” (2012-13), mobiles fashioned from sheets of Mylar manipulated into buoyant loops and folds—their surfaces are still another product of the vacuum tank. In another ground-floor gallery are two of Mr. Bell’s large (six to eight feet tall) coated and/or laminated glass structures, 40 years apart in date, which might have been better sited outside or lighted more intensely. “Gus’s Berg” (1975) is a pair of triangular wedges, supporting a rectangle, which looks deceptively simple, but walking around the piece is like watching origami unfold on a human scale. “Venice Fog” (2017) is a giant, smoky glass cube containing another, completely inaccessible cube, brooding and enigmatic. In the center of the gallery is “Time Machine” (2002), another nod to Wells. Visitors sitting on either side of this big, circular, framed, mirrored glass in Bell-designed chairs will see each other’s features meld into one composite. Tricky, but not really memorable. There are small maquettes for commissions in an adjacent gallery, including a study for a 10-foot-tall installation in Denver in which early-morning condensation produced fog (it was later dismantled). But the most surprising and dramatic twist in Mr. Bell’s artistic odyssey is upstairs, in a subset of the show called “12.” A dozen of the artist’s large mixed-media works on paper pay homage to his interest in guitars and include examples from his collection of more than 150 instruments, from 1920 to the present. Wall text tells of the artist’s fascination with guitars and with musicians like the Weavers and Lead Belly. 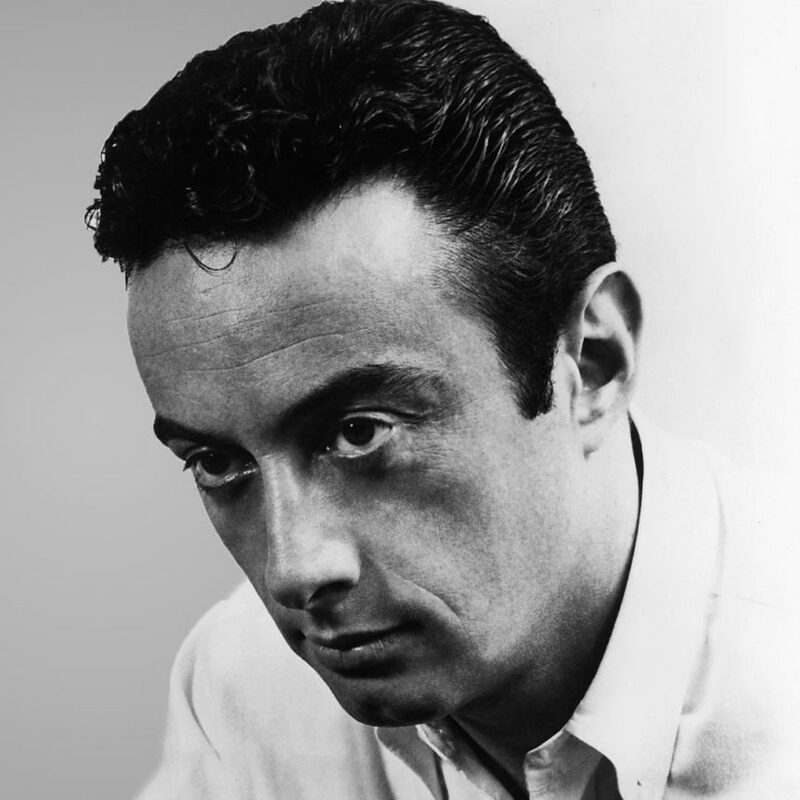 (Progressive hearing loss kept him from any serious musical ambitions, but at the press preview Mr. Bell told a story about a gig at an L.A. club in the 1950s when he followed Lenny Bruce onstage; after he strummed a few chords, the house quickly emptied out.) These are unexpectedly lyrical works, riffs on the guitar’s curves, which inevitably also suggest a woman’s body. The fractured parts of the instrument, exploded and dissected, seem to float in space, almost bending and buckling from the surface. Colors are predominantly silvery, but occasionally shot through with metallic blues and deep reds. The Harwood’s overview is a selective one, hitting most of the high notes in Mr. Bell’s adventures in vaporizing (though it would be interesting to see more on the evolution of that seminal cube sculpture, but maybe that would be a show all on its own). Now nearing 80, Mr. Bell deserves to be right up there in the Minimalist canon, for injecting the austere aesthetics of that movement with luminous splendor. Ms. Landi writes about art and culture from Taos, N.M.